BERLIN/BRUSSELS (Reuters) - Germany and the European Union rejected protests by Turkey over a satirical German television show that mocked President Tayyip Erdogan, saying press freedom was sacrosanct, just as the EU is banking on Ankara's help in solving its migrant crisis. Turkey's foreign ministry last week called in Germany's envoy to explain an NDR broadcast including a two-minute song that poked fun at Erdogan, who is known for his sensitivity to criticism. German newspapers have poured scorn on Erdogan for trying to muzzle media and some have also questioned whether Germany and the EU have gone soft on Turkish human rights because they need Ankara's co-operation to stem the influx of migrants. The incident is particularly awkward for German Chancellor Angela Merkel, who has led efforts to forge the migrant deal between the EU and Turkey, a candidate for EU membership. That deal is designed to stop illegal migrants entering Europe in exchange for financial and political rewards for Ankara, prompting some of Merkel's critics to warn that the EU must not lower its standards on human rights and basic freedoms. A spokeswoman for Germany's Foreign Ministry said on Wednesday Berlin had made clear to Ankara that basic freedoms were "non-negotiable". "(It has been) made clear that despite all the interests Germany and Turkey share, the view on press freedom, freedom of expression is non-negotiable for us," she said, adding, however, that Turkey was an important partner. "We are cooperating with Turkey on various issues, not just the migrant issue but also on Syria," she said. The EU was more forthright in its criticism, saying that summoning the German envoy did not seem to be in line with the EU's cherished freedoms of the press and of expression. "(European Commission President Jean-Claude) Juncker believes this moves Turkey further (away) from the EU rather than closer to us," said a spokeswoman, adding that the EU expected Turkey to uphold the highest standards on democracy, rule of law and freedoms. German newspapers took a tough line against Erdogan. "Dear Turkish President Erdogan ... Germany is not Turkey. 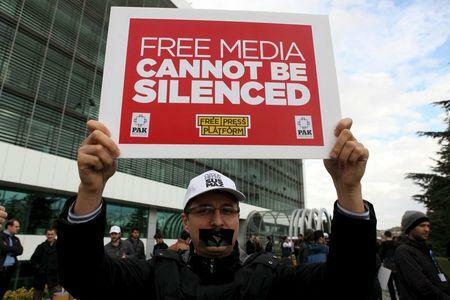 In Germany you cannot muzzle the press," wrote a columnist in top-selling Bild daily. The center-left Sueddeutsche Zeitung also warned that the EU might be becoming over-dependent on Turkey. "Many politicians in the European Union are soft on Erdogan because they need him in the migrant crisis," it wrote. France's foreign ministry said freedom of expression was a fundamental tenet of democracy and "even more so for a member of the Council of Europe and a candidate for the European Union." Erdogan, 62, has dominated Turkish politics for more than a decade, first as prime minister and since 2014 as president. He remains popular at home, but his critics accuse him of becoming increasingly authoritarian and intolerant. Turkish state prosecutors have opened nearly 2,000 cases against people for insulting Erdogan since 2014, the country's justice ministry said this month. The defendants include cartoonists, academics, journalists and even schoolchildren.